ASDA Stores Ltd. (the second largest supermarket chain in the UK, and a subsidiary of American retail giant Wal-Mart) has recently opened The Greenhouse featuring LC SmartGlass. The Greenhouse is ASDA’s industry leading own label development centre dedicated to the research and development of their own label products and brands. 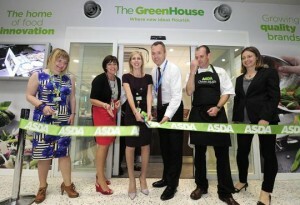 ASDA plans to develop between 2,000 – 2,500 new products, and 500-1,100 product improvements each year at The Greenhouse. To ensure the highest level of quality of their own label brands, ASDA will also test over 40,000 products and competitor products at the new facility. The Greenhouse delivers improved facilities right in the atrium of ASDA House (HQ Building) such as a new enlarged chef’s kitchen, a demonstration kitchen, an improved development kitchen, a large presentation kitchen, and a new non-edible studio. Andy Clarke – CEO officially opening The Greenhouse. Mr. Andy Clarke, CEO ASDA, officially opened The Greenhouse with a huge launch event for the facility including various food demonstrations, a non-edible showcase, and a kitchen academy. SmartGlass International is delighted to have worked with ASDA on The Greenhouse, and we are looking forward to seeing what new products come out of it. LC SmartGlass provides simple and reversible states of transparency with no alteration in light level making it an ideal solution for office interiors where ample lighting is fundamental. This entry was posted in Articles, Press Clippings, Smart Glass News and tagged Architectural Glass, electric frosted glass, electric glass, electric privacy glass, Electronically Switchable Glass, LC smartglass, smartglass, SmartGlass International. Bookmark the permalink.